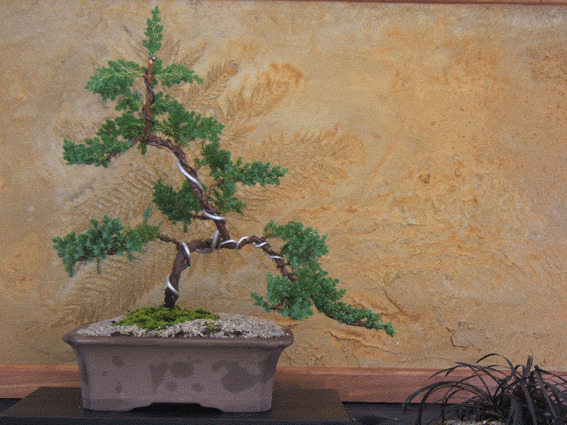 Just a reminder Bonsai trees are out door plants I know the temptation after creating this thing of beauty and placing it in such a nice pot is to bring it inside and look at it. Don't it will kill it or at best make it weak and unhealthy. The best you can do is treat it as you would a vase of flowers and bring it in when you have guests or need a center piece on your dinner table but don't leave it indoors for more than two or three days at a time. Don't be tempted to feed your plant there will be plenty of nutrient in the new soil and feeding may damage the newly developing roots. 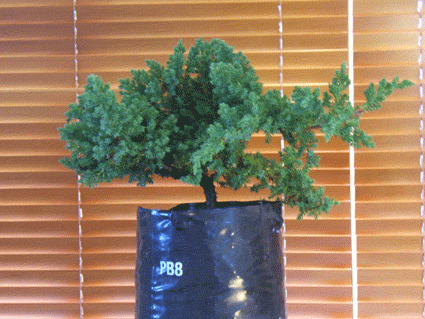 Your tree will last for at least a year in the pot it's in without repotting and at least 6 months without feeding. You may need to feed it through spring and summer after this period Any liquid food will be ok mix it about half the recommended rate but use it more regularly as the frequent watering and the shallow pot leaches fertilizer quite fast. Keep the soil moist don't let it dry out in between watering some of the roots that feed your plant may be as small as one cell thick kill them kill the tree. Find a reliable person to look after you plants when you take that summer holiday.